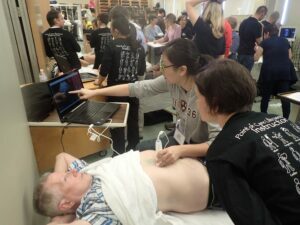 Once again we are offering a complete certification program for physicians in core point of care ultrasound. July 4-6 2015 at the Best Western Plus in Brantford Ontario we will have over 100 models to scan and over 20 instructors to supervise. All three sets of examinations are conducted and upon successful completion, attendees will achieve Canadian Emergency Ultrasound Society Independent Practitioner certification. That’s good for 25 Mainpro C or Section 3 credits in one weekend! For more information visit EDE Bootcamp. Yes the course sold out but we opened up a couple of new places because of demand. Feel free to pass this along to colleagues who look on with envy as you rapidly scan a 1st TM pregnancy patient for them at 7pm.